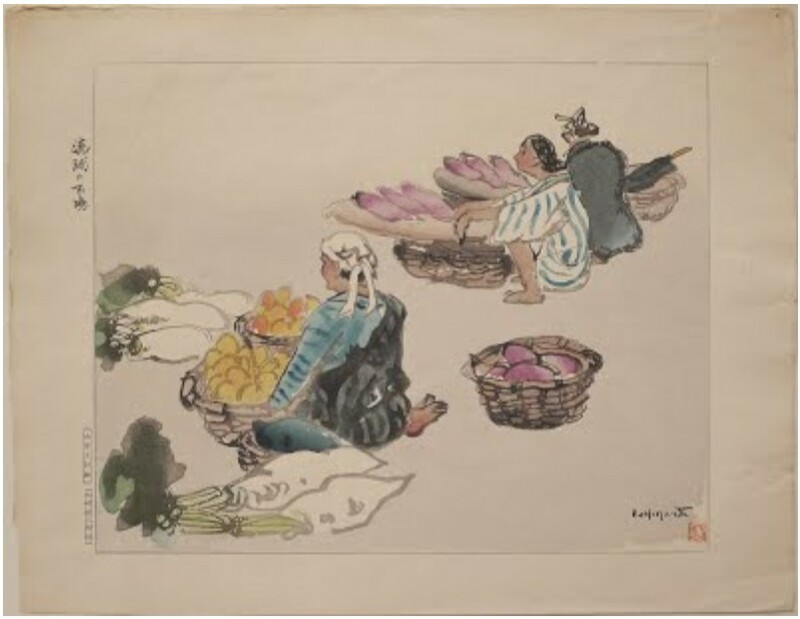 See Ishikawa Toraji’s woodblock print, ‘Ryukyu Market,’ (琉球の市場 Ryukyu no ichiba) c. 1935. Read Okinawa: The Last Battle (U.S. Government Printing Office, 1948), the work of combat historians of the 1st Information and Historical Service, Tenth Army, Roy E. Appleman, James M. Burns, Russell A. Gugeler, and John Stevens. This digitized version of the book is very readable online. “Digital” means you can search for key words, especially useful if you’re interested in details about action in specific towns. The document is divided into chapters to facilitate reading, but this piecemeal approach also forces you to search chapter by chapter rather than the whole book. (Scroll to the middle of the main page for the live table of contents.) Regardless, the reports are riveting in their detail, facts and figures. The photos are very poor, however, and we can only hope that the prints in the hardcopy book are better. 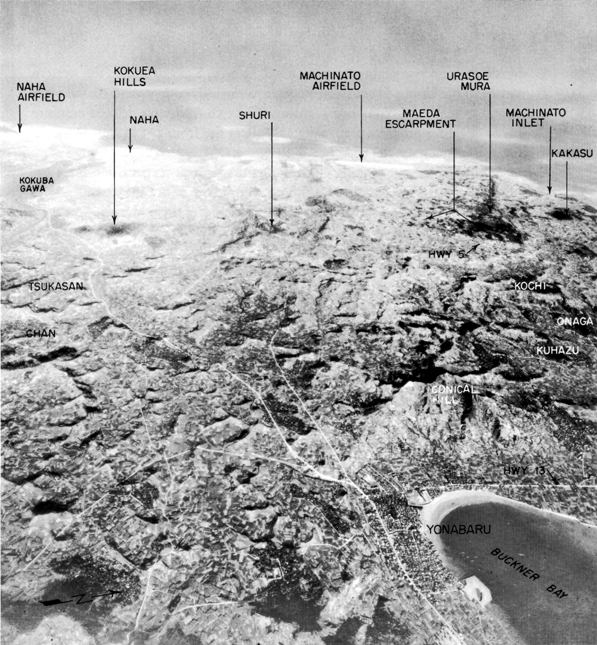 An aerial photo map of the Shuri battleground in southern Okinawa. I found this photo interesting because it lists my parents’ hometowns, Urasoe and Yonabaru, yet unsettling to see them on a battle map. Kokusai Dori is the name of a 2 km stretch of shops, hotels, bars and restaurants which cuts through the heart of downtown Naha, the largest city in Okinawa. The street’s name in English is International Road. It provides a multitude of places to drink, dine, enjoy Okinawan music and buy souvenir’s — everything from cheap bead bracelets sold by street vendors to exquisite and expensive coral statuary in high-end jewelry shops, to traditional glassware and pit vipers pickled in alcohol. On Sundays . . . the street is closed to traffic and opens up to dancers, fire-eaters, street performers and children, who can use an open-air play area created for them in front of the Kokusai Dori Starbucks Coffee shop. The street hosts parades and festivals such as the Eisa folk-dance festival in summer, the Shuri Castle Festival in autumn or the Uchinanchu Taikai (Okinawan Reunion) Festival, held every five years to welcome the global Okinawan diaspora back to their ancestral homeland. Traces of Ryukyu culture are also in the products sold by tourist shops along the street including colorful Ryukyu glassware, shisa (lion-dog statuettes), sanshin (a three-stringed instrument), kariyushi shirts (Okinawa’s version of Hawaii’s aloha shirts), habushu (poisonous snake liqueur) and pastries made with beni imo (purple sweet potato). This entry was posted in Art, Culture, History, Images, Publication, Travel. Bookmark the permalink. Please provide me wz detail itinerary for this year 22016.
Who Is Okinawa Governor Denny Tamaki? Hogen Coffee Shop to Perpetuate Uchinaaguchi? Okinawa Kai of Washington D.C.